Health experts from within and beyond the WHO European Region agree that urgent action is needed to address health-care-associated infections (HAI) and antimicrobial resistance (AMR). Across the European Union, HAI affect over 4 million patients every year, resulting in 16 million extra days in hospital and an annual economic impact of about €7 billion. At a meeting in Madrid, Spain today, organized by the Spanish Ministry of Health and Social Policy, Ms Zsuzsanna Jakab, WHO Regional Director for Europe, explained that HAI and AMR are usually associated with weak health systems. Ms Jakab commended the Spanish Government, currently holding the Presidency of the European Union, for focusing decision-makers’ attention on this urgent issue. She underlined the vital importance of raising public awareness about when and how to use antibiotics, through campaigns such as European Antibiotic Awareness Day, held on 18 November each year. Since their discovery in the 20th century, antibiotics and related medicines (such as penicillin, streptomycin and more than 150 others) have substantially reduced the threat posed by infectious diseases, saving the lives and easing the suffering of millions of people. Nevertheless, this medical advance has been threatened in recent years by the emergence of microbes that are resistant to the cheap and previously effective drugs available (first-line drugs). Patients with infections caused by resistant microbes fail to respond to treatment, leading to prolonged illness and greater risk of death. When first-line drugs prove ineffective, treatment must switch to second- or third-line drugs, which are almost certainly more expensive and often more toxic. Most alarming are diseases in which resistance is developing to most of the currently available drugs. Multidrug-resistant tuberculosis (MDR-TB), resistant to the most important first-line TB drugs (isoniazid and rifampicin) and extensively drug-resistant TB (XDR-TB), resistant to first- and second-line drugs, are of particular concern in the WHO European Region. Human behaviour has amplified and accelerated AMR, through a combination of overuse in many parts of the world, misuse due to lack of access to appropriate treatment and underuse due to lack of funds to complete treatment courses. WHO bases its approach to HAI and AMR on partnering with stakeholders and addressing cross-cutting issues. This approach builds on the WHO Global Strategy for Containment of Antimicrobial Resistance (2001), and covers strengthening health systems, controlling infections and improving antibiotics use, patient safety, food safety and zoonoses control, as well as programmes to stop TB, HIV/AIDS and malaria. Strengthening surveillance across the WHO European Region – through projects such as the European Surveillance of Antimicrobial Consumption, funded by the European Centre for Disease Prevention and Control (ECDC), and networks such as the European Antimicrobial Resistance Surveillance System – is also vital to assess and monitor the issue. research to develop new tools. 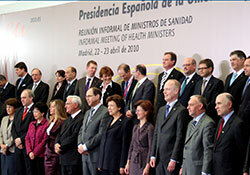 AMR will be the focus of World Health Day, 7 April 2011.